Matlock are still hunting their first goal of 2019 after another frustrating afternoon against a good Nantwich side who scored eighteen minutes from time through Joe Malkin to take all three points home to South Cheshire. 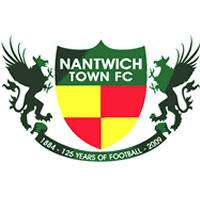 Nantwich, in fourth spot at kick off, still nurtured title hopes and were the more dangerous side for most of the contest. Matlock worked hard but on the day, lacked the quality and invention to open up the visitors defence. Matlock’s goalkeeper Ross Durrant was far the busier of the two goalkeepers with Nantwich’s Will Jaaskelainen having a relatively easy time of it. Michael Williams and Craig Westcarr replaced Marcus Marshall and Luke Hinsley in two changes made by manager Dave Frecklington who was able to include midfielder Nathan Whitehead, who had been injured since the beginning of December, on the bench. Nantwich named former Stoke City and Jamaican international Ricardo Fuller as a substitute and he made a brief cameo appearance towards the end. Nantwich began brightly attacking with pace down the flanks, a cross by Callum Saunders, son of former Derby, Liverpool and Wales forward Dean Saunders, flashing across the Gladiators box. After a Craig King cross was deflected behind, Matlock won two successive corners which came to nothing. Saunders had a shot charged down after Nantwich took a free kick quickly before James Lawrie miskicked as he attempted to convert a cross from the right. The first serious opportunity though came on 24 minutes when Durrant produced a brilliant diving save low to his left, having to change direction at the last minute to keep out a long range strike from Malkin. Five minutes later Durrant was busy again keeping out an effort from a similar distance from central defender Toby Mullarkey. Greg Tempest skied a volley high over the bar for the Gladiators who then saw Dwayne Wiley glance a corner from the left wide, a few minutes after he had been booked for bringing down Malkin. Westcarr turned smartly but his shot was blocked, the ball though finding Williams on the right flank who delivered a mouth watering low cross which was an inch or two beyond the fast approaching Jamie Jackson when the slightest of connections could well have seen Matlock in the lead. A marvellous covering header by Adam Yates denied Nantwich from breaking and causing danger again, the half ending with Jamie Morgan falling theatrically in the box with penalty appeals being quite correctly refused and Matthew Bell being booked for a mistimed challenge on King. Rain greeted the teams in the second half with Matlock showing first as Westcarr’s cross was deflected away from Jackson with Nantwich comfortably clearing the follow up cross from Brad Beatson who minutes later shot harmlessly wide of the near post. Nantwich won a corner with Durrant being ideally positioned to hold a volley from Bell before keeping out a shot from Malkin and Mullarkey tried his luck from distance again, his shot dipping as it sped over the bar. But the breakthrough came when substitute Joe Mwasile broke purposefully from deep,and with Matlock switching off at the back, the ball broke for MALKIN to stroke past Durrant, the referee having played a decent advantage with Mwasile looking to have been fouled in the box in the build up. Matlock forced two corners quickly in a bid to restore parity. Luke Hinsley entered the fray and his first touch might have been a golden one only for the ball to run away from him as he teed up his chance on the left. Yates headed over from another flag kick before the final chance came and went when Jackson drove wide from a tight angle. Nantwich deserved their win as they made Durrant work hard, Jaaskelainen not being seriously extended at the other end. The workrate from Matlock could not be faulted but missing is that extra little spark and belief that was there in abundance before Christmas in a spell when Matlock beat Nantwich 4-1 on their own ground.